We need farm communities that can grow food. Srila Prabhupada predicted that, "One day millions of people would be coming to our Hare Krishna farms because they are unemployed. And we must accept them. We must feed them. We must let them live there and they will gradually become spiritualized. We will put them to work, they will get their food and there will be prasadam. 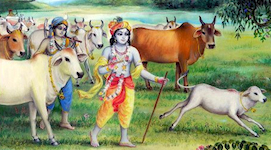 They will hear something about Krishna and they will gradually by the millions become devotees."